This, frankly, is better writing about music than most music writers are capable of: perfectly capturing the way Franklin’s voice entwines struggle and salvation, and situating that quality within the history of American music and society. 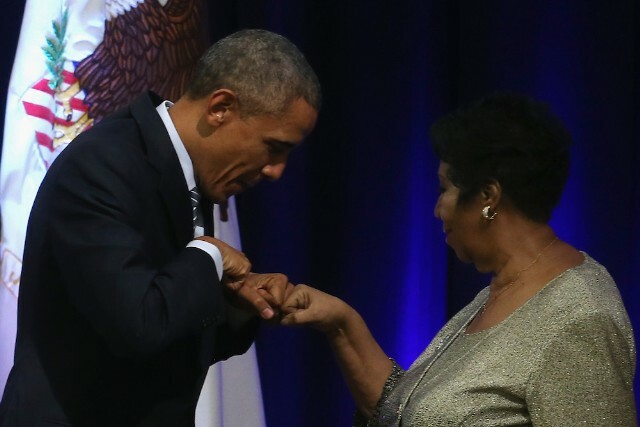 Perhaps the better Obama-era performance to remember Franklin by, then, is her triumphant appearance at the 2015 Kennedy Center Honors. Franklin sings “(You Make Me Feel Like) A Natural Woman,” written for her by Kennedy honoree Carole King with her then-husband Gerry Goffin in 1967. Barack and Michelle Obama sit in the balcony next to King. The songwriter’s response to Franklin is instant and apparently overpowering, kinetically mirroring the singer’s raptrous highs and earthly lows. Franklin sits at the piano and pounds out the song’s bluesy introduction; King’s mouth falls open. Franklin leaps unexpectedly to an aching high register to finish the second verse; King shivers, her eyes seem to roll back, she covers her face with her hands. The president’s reaction, at least what the cameras show of it, is more physically subdued. Early on, he wipes a tear from his face. In a later chorus, as Franklin slides way behind the beat, enacting ecstasy and abandon but always fully in control, he tries to sing along for a few words. He gives up soon enough, shaking his head as if in disbelief of what he’s hearing.